Now that you've installed iOS 5 on your iPhone, you can replace the default iPhone vibrate pattern with your own custom rhythms. Even better, iOS 5 gives you the option to create custom vibration patterns for specific people in your contacts list. It might seem silly, but assigning unique patterns to particular friends and family members is a great way to tell whether you should interrupt a meeting to answer a call--without having to look at your phone to see who's calling. Here's how to create and assign custom vibrations. Follow these simple steps to personalize your iPhone with custom vibrations. 1. 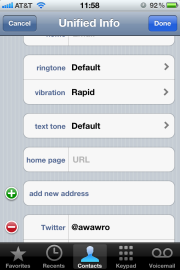 Navigate to the Accessibility menu of iOS 5 (by tapping your Settings app, and selecting General and then Accessibility), and enable Custom Vibrations. 2. Navigate to Settings, Sounds, Vibration to record a custom vibration pattern that will replace the default iPhone vibration. 3. Use the touchscreen to tap out a custom vibration pattern. When you're finished, tap Stop. To double-check your pattern, press the Play button; then save the pattern with a custom name. Use the Contacts menu (bottom center) to assign custom vibrations to your friends. 4. To assign a custom vibration pattern to play only when a specific person calls, open the Phone app, switch to the Contacts tab, tap the contact to whom you want to assign a custom vibration, and select Edit, Vibration, Create New Vibration.